I wonder if Hoka will be releasing these for sale anytime soon and how they rationalize these kinds of racing shoes against their core philosophy. Ever since New Balance discontinued the Minimus Trail MT00, and even though I stocked up on a couple of extra pairs, I have been on the lookout for a new ultra lightweight trail shoe that is currently in production. A few weeks ago I bought a pair of inov-8 Trailroc 235 shoes to fill the role of "robust trail shoe" which I might use in my next Ultramarathon. The 235 is such a great shoe that I thought I would take a look at the other shoes in the Trailroc line. I was psyched when I discovered an even lighter-weight shoe, the Trailroc 150. 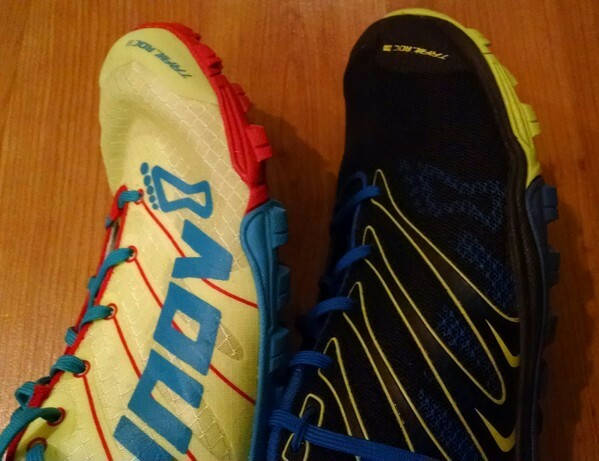 I am a big fan of the inov-8 Bare-X Lite 150 which I use for my 5k road racing shoe, so I had hopes that the Trailroc 150 would be great, too. The black shoe pictured below is the Trailroc 235. The florescent yellow shoe is the Trailroc 150 (I really like the bright flashy color scheme!). Both shoes are from the "Zero" category of inov-8 shoes which means there is no difference between the height of the forefoot and the height of the heel. 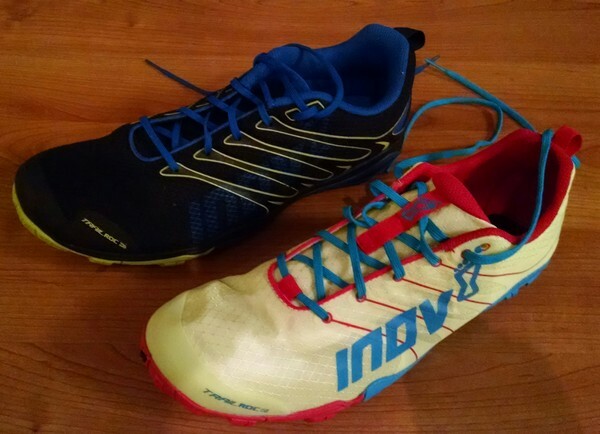 Both shoes are made on the inov-8 "standard" last which is supposed to provide more room in the toebox than inov-8's performance last. I only wear zero drop shoes with a wide toebox, so the Trailroc 150 should have been a good option for me. There are a number of reviews and videos on the web that are mostly positive (and helped me decide to order the Trailroc 150 in the first place). Unfortunately, the Trailroc 150 has a number of issues so I didn't take a chance running in them before returning them. The outsoles of the 235 and 150 are pretty much identical in lug pattern (they seem to be made from the same mold). The lugs are not huge but fairly aggressive. You can see a slight difference in the outsole as it wraps up around the outer edge. The 235 has a 6mm footbed and the plane of the footbed surface is pretty much even with the top of the outsole edge. The 150 has no footbed and the plane of the footbed surface sits down inside the "valley" created by the outsole wrapping up around the edge. This minor difference is huge for the fit of the shoe. In the 235, my pinky toes have a lot more room since they can push out into the flexible upper material. In the 150, my toes were trapped in the narrow canyon and could not splay properly. 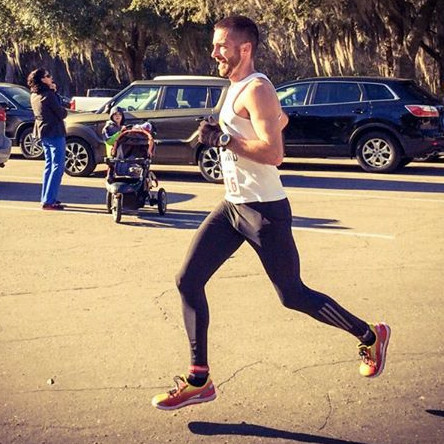 This past weekend I ran in the Lloyd Clarke Sports Newnan's Lake 15k. Weather was sunny and cold, great for racing, as seems to be the case almost every year. I finished in 58:20, won my age group, and pulled off a lifetime personal best at this distance by 1 minute 30 seconds. Huge PR! I am really happy with the results because I was able to do this at the tail end of marathon training with legs that were definitely not feeling fresh. 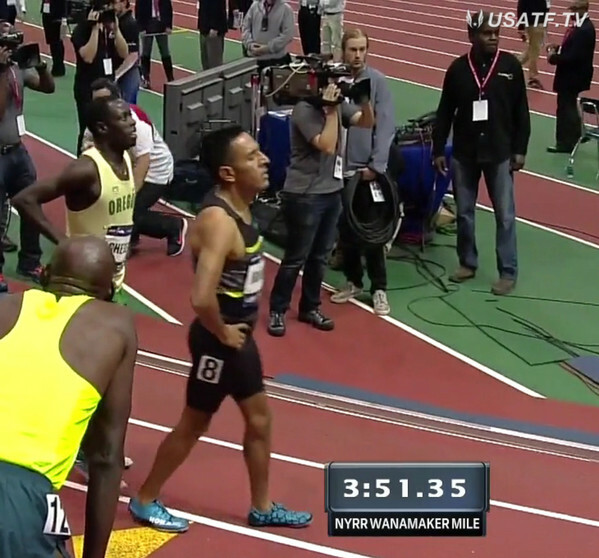 I was able to finish the race strong with my last three mile splits 6:12 each. I have started a personal tradition to go on a long trail run whenever I am in Ohio to visit my parents. 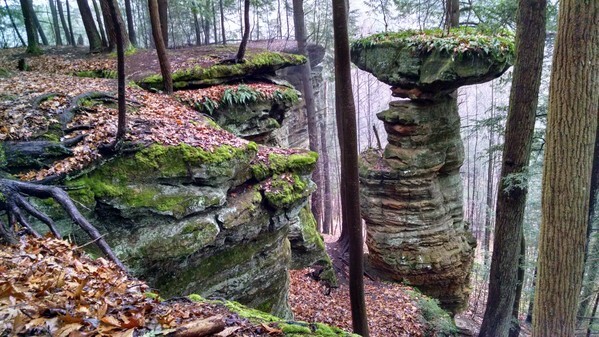 Even though I lived within an hour of the Hocking State Forest area trails when I was younger, I never used them for trail running. There are many trail areas that I never even knew existed! 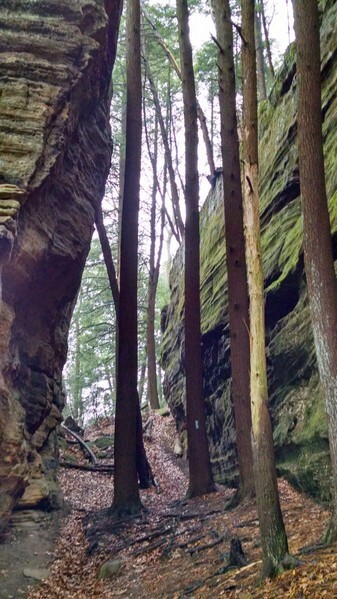 Christmas 2014 was my second long trail run in the Hocking Hills. 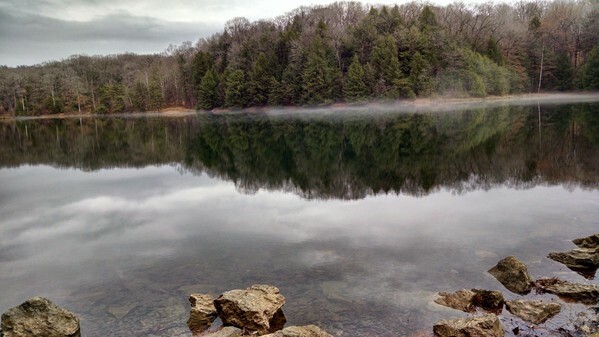 On my inaugural run a couple of years ago, I ran from Old Man's Cave to Ash Cave and back along the Buckeye Trail that travels through the state park and most of those trails were at least familiar from my younger years. This time, I wanted to explore parts of the Buckeye Trail that were new to me. The Old Man's Cave parking area on State Route 664 makes a good starting point because of the heated visitor's center that includes working water and restroom facilities year-round. 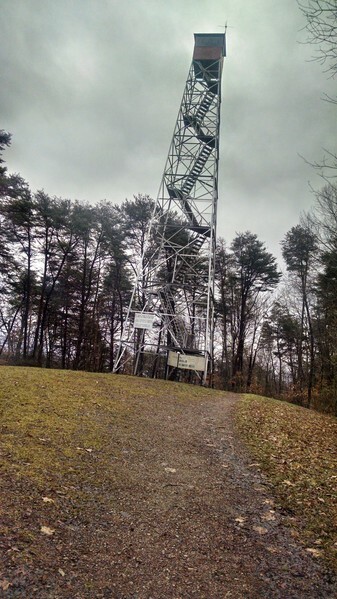 Note that some of the trails in the park are undergoing major maintenance and are currently closed or re-routed. Based on weather reports I decided to do my run a few days before Christmas rather than trying to run on Christmas Day. It was cold but there was no real rain. I first ran north from the Old Man's Cave parking lot. There are some notes on finding the Buckeye Trail from this location below. 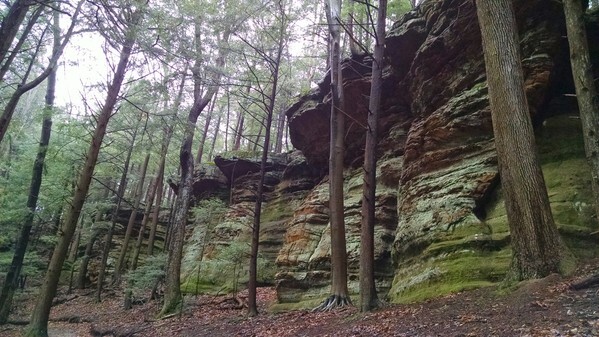 I ran the Buckeye Trail to the Hocking Hills Climbing and Repelling area parking lot which is about 3.5 miles one-way. If you just wanted to see the Climbing area, the parking lot on Big Pine Rd / CR 11 is going to be your best bet. I had left some notes of my running plan with my parents, and even though I wanted to continue northward along the Buckeye Trail at this point, I followed my plan and returned to Old Man's Cave. My plan from here was to run to Ash Cave as I had on my previous visit. This time I ran "up top" on the Gorge Overlook Trail instead of down in the gorge along the creek due to the trail maintenance and closures. Rose Lake was beautiful to look at. I suggest enjoying Rose Lake from the dam area and not by running around it on the shoreline trail. The trail is steeply cambered and not much fun.